Fes or Fez (Arabic: فاس‎ [Fās], French: Fès) is the seicont lairgest ceety o Morocco —efter Casablanca, wi a population o juist ower ane million. It's the caipital o the Fès-Boulemane region. Fes, the umwhile caipital, is ane o the kintra's fower "imperial ceeties," the ithers bein Rabat, Marrakech an Meknes. 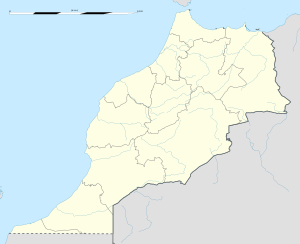 It comprises three distinct pairts, Fes el Bali (the auld, wawed ceety), Fes-Jdid (new Fes, hame o the Mellah) an the Ville Nouvelle (the French-creatit, newest section o Fes). Fes el Bali is a UNESCO Warld Heritage Steid. Its medina, the lairger o the twa medinas o Fes, is believed tae be the warld's lairgest contiguous caur-free urban aurie. The University o Al-Karaouine, foondit in AD 859, is the auldest continuously functionin varsity in the warld. Wikimedia Commons haes media relatit tae Fes.